It was a dreary cool day yesterday and I was craving a slow roasted chicken. I simply seasoned the bird after rubbing it with a whole bulb of garlic. I slow roasted it in the oven for four hours and basted it every 30 minutes after 2 hours. The entire house smelled amazing. 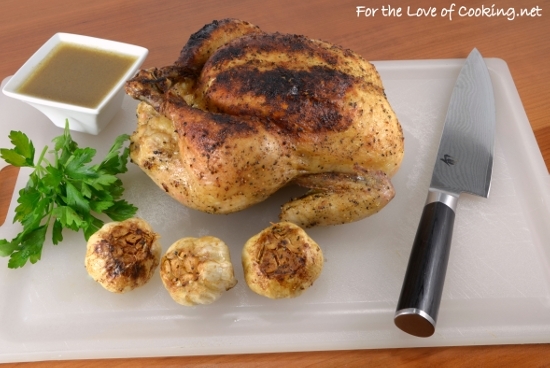 The chicken was perfectly cooked – tender, juicy, and flavorful. I served the pan sauce over the chicken meat then squeezed some of the roasted garlic on top. It was amazing! This slow roasted garlic chicken paired beautifully with the roasted delicata squash topped with pomegranante seeds, pepitas, and feta cheese. Clean chicken – pat dry with a paper towel. Remove neck from cavity, if needed. Cut the top portion off of each bulb of garlic. Rub the olive oil over the bird, if desired. Rub one bulb all over the entire chicken. Gently loosen the skin (without ripping) and rub the bulb of garlic over the breast meat. Place the garlic bulb along with half of the onion, and half of the lemon inside the cavity. Season the entire bird with garlic powder, sea salt, and freshly cracked lemon pepper, to taste. Lightly spray the bird with olive oil cooking spray. 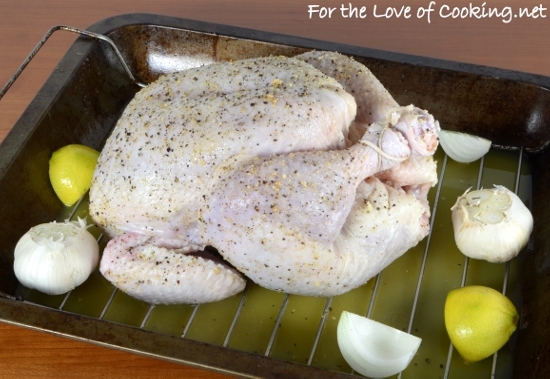 Place the chicken on a roasting tray in a roasting pan; pour the chicken broth into the pan. Place the remaining half of onion pieces in the pan along with the other lemon half and the three garlic bulbs. Place the meat thermometer in the thigh of the bird making sure not to touch bone. Roast uncovered for 2 hours. Remove the three garlic bulbs in the pan and wrap them in tin foil, place them back in the pan. Baste the bird then place back into the oven. Baste every 30-40 minutes for another 1 1/2-2 hours, or until the meat thermometer reads 170-175 degrees. If you want crispy skin then don’t baste for the last hour (or put under the broiler for a few minutes right before the bird is done). Remove from the oven and let the bird rest for AT LEAST 10-15 minutes before carving. Pour the liquid from the roasting pan through a fine sieve into a saucepan. Cook over medium heat until boiling; reduce for 1-2 minutes. Remove from heat. 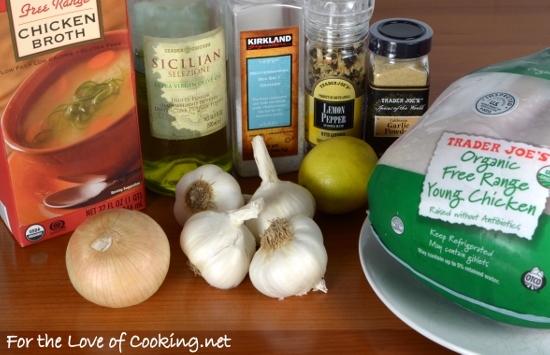 Pour the sauce over the chicken and serve with the roasted garlic squeezed on top. Enjoy! Looks very good Pam and I like the idea of the roasted garlic at the end. mmm…garlic!!! Your kitchen must have smelt heavenly while baking this! 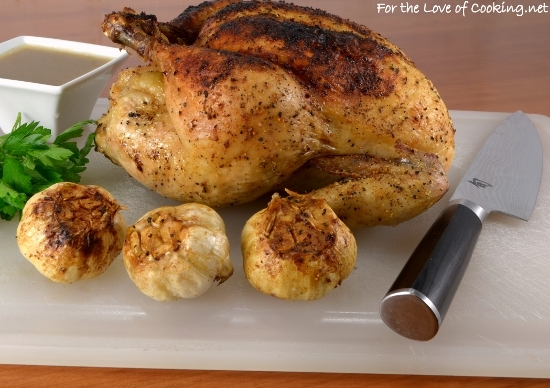 You are so right – nothing like the smell of a roasting chicken in your kitchen. Your recipe looks so delicious.